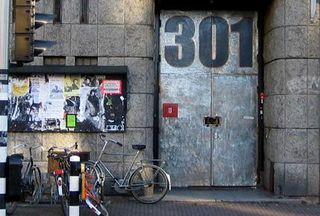 The OT301/EHBK is a big adventurous project that started in 1999 when we squatted the building with a group of artists. We squatted the building to create a new platform where artists could live and work together and could work on a public programming that offers a stage to ‘experimental’, ‘new’, ‘alternative’ art, music, film, dance, theatre, workshops and other sorts of performances and shows we choose to put on. Everything we do is based on the fact that we are a creative non-profit organisation. That doesn’t mean that we don’t need money to pay our bills but it means that nobody in our building is making a lot of money and most of the income is used to maintain and develop our building and organisation. Within our building/organisation we have 24 members and all together we share the responsibilty to maintain and secure everything that happens in our building. We are not just a place where people rent an office or studio, everybody is expected to contribute to the group because otherwise we can not exist. Besides sharing the responsibility for the building and protecting its vision everybody is working on his/her own projects within the building.